This MDSWI8 series product has been discontinued. Consult Sales to inquire about remaining inventory. The zSeries 1⁄8 DIN panel meter and controller can monitor up to 8 wireless sensors. The compact instrument connects directly to an Ethernet network and the Internet and features OMEGA's awardwinning embedded Web Server. It is easily configured and monitored with a Web browser over the Ethernet network or the Internet. Alternatively, the wi8 meter-controller can instead be connected to the USB port of a single computer with a "USB Ethernet Adaptor" that are inexpensive and widely available. The wi-8 meter-controller comes standard with a choice of either two Form C relays, or two SSRs (solid state relays) that can be used for control functions or alarms. The wi8 meter can monitor alarm conditions for any or all of the wireless sensors. For example, the wi-8 meter can be set up to trip an alarm if any one of the sensors indicated it was above or below a pre-set alarm point. The OMEGA zSeries wireless monitoring and control system provides local monitoring and control, along with remote Web-based monitoring of temperature from thermocouples, RTDs, and semiconductor sensors. The wireless sensors transmit up to 1000 m (3280') (without obstructions or interference) to a zSeries monitor-controller connected directly to an Ethernet network and the Internet. The wireless system complies with IEEE 802.15.4 operating at 2.4 GHz. Note: Distances for UWTC-1, UWRTD-1: up to 60 m (200'), UWTC-2, UWRTD-2: up to 120 m (400'), zED-x-P: up to 1000 m (3280'), zED-x: up to 90 m (300') all distances without obstructions or interference. The OMEGA zSeries system let's you monitor and record temperature over an Ethernet network or the Internet without any special software.just your Web Browser. OMEGA offers a wide and growing selection of wireless sensors for a variety of applications. Depending on application, the wireless sensors are powered by 2 "AA" batteries, a single lithium battery (approx "AA" size), 2 "D" cell batteries, or an external AC adaptor that operates on any voltage worldwide from 100 to 240 Vac. Wireless sensors are available with external probes appropriate for an almost unlimited variety of industrial and commercial applications. The zSeries meter-controller-scanner is an independent node on the network sending and receiving data in standard TCP/IP packets. It is easily configured from a Web Browser and can be password protected. From within an Ethernet LAN or over the Internet, the user simply types the IP address (such as 192.168.1.200) or an easy to remember name (such as "Oven 5" or "Chicago Test Fixture") and the wiSeries meter serves a Web Page with the current readings. The zSeries meter can trigger an alarm if variables go above or below a set point that you determine. Your alarm can be sent by email to a single user or to a group distribution list. OMEGA Enterprise Gateway software is a free and easy program for this application. The zSeries meter-controllers operate on any AC voltage worldwide from 90 to 240 Vac and 50 to 60 Hz. The metercontroller connects directly to an Ethernet Network or the Internet. Unlike an RS232 or USB device, it does not require a host computer. The OMEGA zSeries wireless sensor system is easy to install, simple to operate, and features OMEGA's awardwinning iServer technology with an Embedded Web Server that requires no special software. 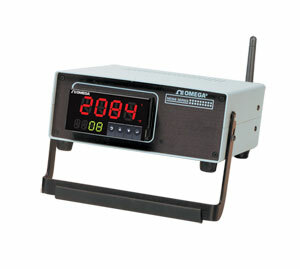 The OMEGA zSeries system serves Active Web Pages to display real time readings and charts of temperature. You can also log data in standard data formats for use in a spreadsheet or data acquisition program such as Excel or Visual Basic. OMEGA offers a free and easy to use program for logging data to Excel. The virtual chart viewed on the web page is a JAVA. Applet that records a chart over the LAN or Internet in real time. With the OMEGA zSeries system there is no need to invest time and money learning a proprietary software program to log or chart the data. Chart scales are fully adjustable on the fly. For example, the chart can display one minute, one hour, one day, one week, one month or one year. Temperature can be charted across the full span (-40 to 125±C), or within any narrow range such as (20 to 30±C). OMEGA offers an OPC Server software that makes it easy to integrate the zSeries wireless sensor system with many popular Data Acquisition and Automation programs offered by OMEGA, Wonderware, iConics, Intellution, Rockwell Automation, and National Instruments, among others. The OMEGA zSeries feature OMEGA's patented programmable color displays. The display can be programmed to change color at any set point or alarm point For example, the zSeries can be programmed to display the process value in GREEN during warm-up, switching to AMBER to signal the normal operating range, and in RED to signal an alarm condition. The changes in color are quickly seen from a distance, and machine operators can intuitively react to changing conditions. The colors can be programmed to change back when the value drops back below the alarm point or to "latch" on until being reset by the operator. The zSeries can also be programmed to display only one unchanging color: GREEN, AMBER, or RED. This is a useful way to let an operator identify, at a glance, process values in three separate locations, or to display three different measurements such as Temperature, Pressure, and Flow. The innovative OMEGA zSeries of meters and controllers features an extended 1 year warranty at no extra charge.